People ride Lime and Bird scooters along The Strand in Santa Monica, Calif. The latest tech-enabled transportation fad to careen out of Silicon Valley is worrying some public health officials. 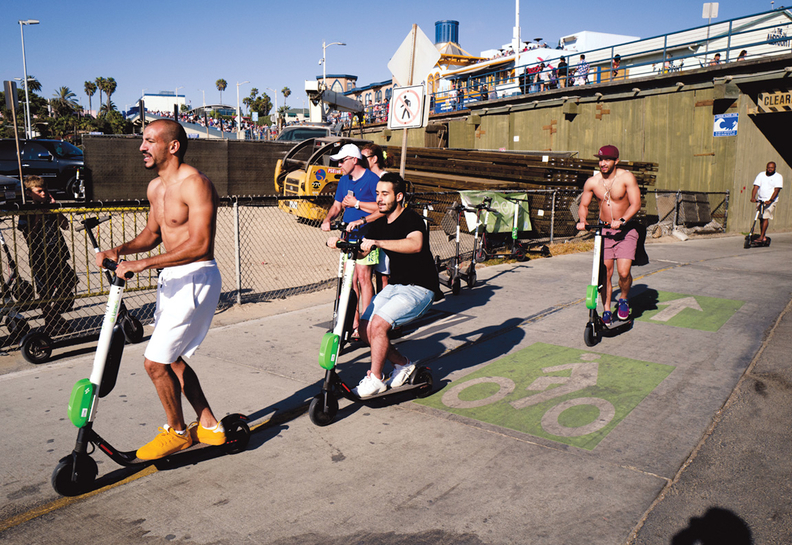 Shared electric scooters that are rentable by the hour via apps are reportedly causing spikes in severe injuries after the trendy mode of transport is introduced into a city by companies such as Bird, Lime and Skip. San Francisco public health officials are partnering with researchers to collect data on the injuries. “I can say that several years ago that I didn't see these types of injuries happening, and now I do,” Dr. Catherine Juillard, a trauma surgeon at Zuckerberg San Francisco General Hospital and one of the researchers, told the New York Times. The new mode of travel poses data-collection challenges for public health officials since the category for reporting such accidents lumps together “scooter crash,” “squirrel attack,” and loads of “other” accidents, according to Dr. Christopher Colwell, an emergency medicine professor at the University of California at San Francisco who is working with Juillard on the project.